The leaves that is used as Pearl Jasmine tea is a high grade of young and tender green tea leaves, they are naturally scented multiple times with fresh jasmine flowers. After the tea has been scented, the leaves are hand rolled into pearl shaped balls which gives this tea its name. When steeped, these leaves unroll and produce a tea with a pronounced floral and fresh green tea scent, a full-bodied refreshing sweet taste, and a pleasing long lasting floral aftertaste. PREPARATION: To prepare Pearl Jasmine tea, we recommend either a regular teapot or individual steeping cups. Allow 1 tsp of tea leaves per serving. Cover with water no hotter than 80°C, (176°F) and allow to steep for 3 to 5 minutes depending on desired strength. 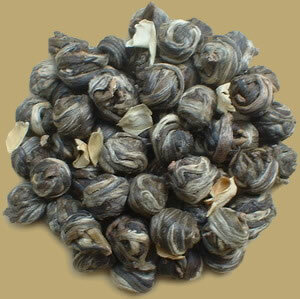 Pearl Jasmine tea generally may be resteeped several times.